The white finished Ricochet double panel designer radiator from Premier, bring a stylish simplicity to any room with the 1750 x 354mm designer radiator. Make a statement with our designer radiators, guaranteed to be the focal point of any setting. Premier provide luxury designer bathroom products at desirable prices, combining comfort and reliability with practicality and quality craftsmanship. 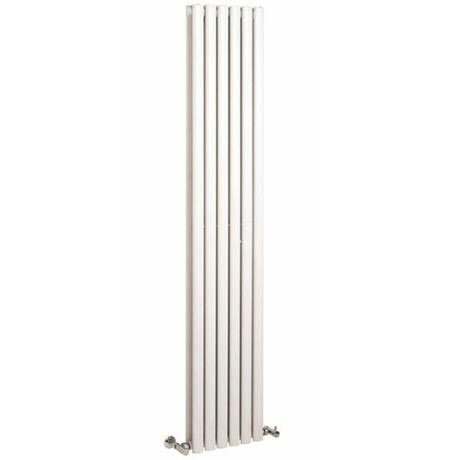 Hi, unfortunately as the Premier Ricochet Double Panel Radiator is a unique setup, we would advise that you seek advice from your plumber or fitter. Thanks. The closest match is the cypress double panel radiator - HCY009 -product code can be found on our site.It has slightly different measurements but a much higher BTU. Hi Katie. We actually sell a horizontal version of the Ricochet Radiator in white, which comes with the horizontal brackets. Please search MTY082 in our search bar to see this option. There is also a link to valves in the product description, I couldn't recommend any without knowing where the pipes are coming from and whether you are looking for thermostatic or not. Hope this helps you out! Q. This radiator came up in a search for radiator with heated towel rail - is there an option to include this? I think the Hudson Reed - Magnetic Towel Rail - product code -ACC005 would work well for your needs. This product code can be found on our website. Bought this upright radiator to install in my new kitchen when tight on space. Was impressed by the excellent quality and appearance - it looks much more expendsive than it actually was! Have received losts of positive comments from friends - a stylish addition to a modern kitchen rather than a traditional radiator. Excellent service too,from ordering to prompt delivery.